Every two years CertainTeed Gypsum searches for stand-out projects in drywall installation. We are talking the best-of-the-best in hanging, taping, mudding and finishing. This is a drywall competition specially designed for drywall installers and finishers. We are looking for and celebrating craftsmanship in the field. But first we need to find the projects. Do you have a project you’ve been a part of that stands out from the competition? Here’s what you need to know to get involved and get recognized. Ok, now that you have your project in mind, we are going to help you craft a submission that will grab the judges’ attention and get your project the second look it deserves. You don’t have to stick exclusively to the drywall install here. What makes this project stand out from the rest? Was there something unique or interesting about the design? Was it built in a unique or challenging location? Include these details. The Holy Name of Jesus Cathedral was the 4th U.S. Trophy winner for non-residential construction. 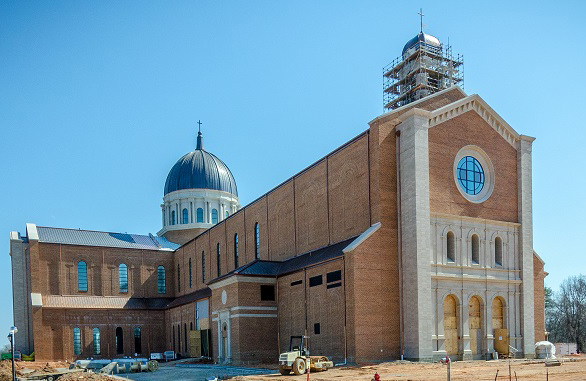 While the dome was the drywall show-stopper, it was in part their ability to blend classic design elements, such as a 600-year old cruciform floor plan design, with modern applications that made the project standout. On their application they included a combination of repurposed and locally sourced materials that contributed to the sustainable, high-performance design of the structure, which also touts energy efficient lighting, heating, cooling and electrical systems. The creative use and application of modern building materials and sustainable design practices contributed to the speed and timely execution of the project, which was completed within budget in just two and a half years. Sometimes when we do things routinely we forget the impact of these actions. While you are reviewing your project ask yourself the following questions? Were there any environmental precautions taken? Were materials recycled or actions put into place to cut down on waste? Were materials locally sourced when possible? Were there any safety victories? Did you complete the build with no lost time due to injuries or best OSHA requirements? Were improvements made for end-user comfort? Were measures taken to control for sound or air quality? Think about the entire scope of the project. Sometimes small daily actions add up to large impacts. Your project wasn’t LEED certified and it didn’t win any major awards? That’s OK. You still have achievements or you wouldn’t be considering your project for a Trophy Award. Where were the exclamation points on this project? Level 5 finishes? Seamless transitions? Integrated functionality? Was it under budget or delivered ahead of schedule? Let the judging panel know. Even if your project has already racked up a shelf worth of awards take the time to explain the project achievements in your own words. Also consider including end-user feedback. Do the new owners love the final product? Have the current occupants been sharing unsolicited praise? Include this. They don’t say a picture’s worth a thousands words for nothing. Make sure your pictures do the project justice. Include photos of the project in progress as well as the finished work. Include all the highlights. If you sculpted the most amazing arched ceiling or designed a climbing wall out of drywall make sure there is photographic evidence. If you can, include images of CertainTeed products in use. This is not required but it is a CertainTeed competition and the judges certainly won’t hold it against you. You are not a photographer. We completely understand. Find someone who is. Grab a friend, a colleague; hire a professional. This is not a school project. You do not have to do all the work yourself, but your project can only be judged on what is provided. If the images are out of focus or don’t provide the appropriate context the judges will not be able to properly access your skills. You don’t have the perfect company profile. Your project description isn’t going to win any writing awards. That’s ok. It doesn’t have to be perfect. We are not judging your application or your grammar. We are judging your project. Give us the details, the “oh wow” moments, get the judges interested. You make it to the national stage, we can help you clean up the rest. Good luck. We look forward to seeing what this year’s competition brings. Ready to get started? Nominate a project. Plus, see pictures of previous winners and Trophy FAQs.